hey. so it’s international day of the girl here. so. I just wanted to tell you how much I appreciate you. I am stronger because of you. This was part of a longer message I received on Tuesday from one of my closest friends who is currently studying abroad. I replied with something to the effect of: omg same ilysm omg xoxoxoxo miss you luv you because I feel exactly the same way about her. My close friends are some of the most sacred individuals in my life; I hear their stories and they hear mine. 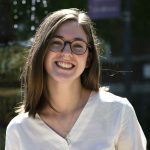 This week, Abby King wrote a story about how the annual safety and security report finally reported four counts of sexual offenses on Goshen’s campus in 2016, and how this reflects an updated system of reporting. I affirm these changes, as well as the work of others fighting for steps forward all the time. But today I’m not writing about the turmoil in the midst of the experiences, the go-arounds with police or administration or perpetrators, the ongoing Weinstein debacle or the reporting system at GC. I’m focused on the aftermath, what happens when we get up everyday weeks, months, years later. We move forward, we share with those who support us. My friend who sent me that message from across an ocean knows my story. She knows me. She cares about me in a way that goes beyond a statistic or an annual report. What is it about the current campus culture that reflects in the rows and rows of zeroes, year after year, that we know as a community are wildly inaccurate? To me, there’s a difference between administration changes that affect things like reporting systems or committee formations, and campus culture changes like feeling safe enough to talk about our stories with groups of people. What if we could replicate our intimate affirmations of our deepest, darkest secrets from our friends on a campus-wide level, and encourage story-telling in a safe environment, in order to better protect members of our campus moving forward? What if instead of waiting for the administration to create safe spaces or accurate reports, we shared our stories anyway, supported and empowered by our peers? What mini-revolution would our vulnerability at an individual level create on campus, for the administration? In her 2014 book Small Victories, writer Anne Lamott talks about finding her inner circle and eventually getting sober with them. She talks about how these women heard the worst and the ugliest things about her and they still wanted her. Our friends are in on that. What if our campus was, too?